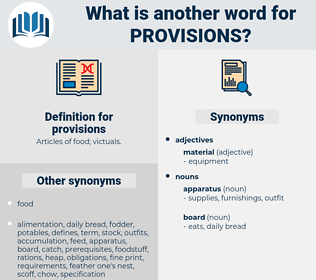 What is another word for provisions? purposes, stipulations, mechanisms, supplies, obligations, Resources, schemes, verdicts, applications, systems, substances, options, stores, claims, Prescriptions, appropriations, specifications, instruments, Ships, normas, Rights, Judgments, rulers, conditions, laws, credits. Prescriptions, appropriations, initiatives, specifications, matters, instruments, norms, processes, rulings, Ships, normas, documents, sentences, entitlements, safeguards, Criteria, Rights, Judgments, referees, rulers, Activities, conditions, laws. prohibitions, Provisos, proposals, legislations, propositions, statutes, declarations, protections, purposes, wordings, specifics, stipulations, Recommendations, restrictions, interpretations, revisions, agreements, representatives, prerequisites, conventions, portions, points, Guarantees, previsions, reservations, disciplines, considerations, impositions, preparations, pronouncements, commitments, preconditions, offers, PROSPECTS, responsibilities, structures, subsections, resolutions, chapters, precepts, mandates, versions, factors, offences, violations, characteristics, perspectives, Pensions, bans, Expenditures, decrees, enactments, scenarios, Opportunities, precautions, commissioners, registrations, accommodations, Guidelines, definitions, exemptions, projections, imperatives, mechanisms, indications, materials, installations, supplies, Programs, Undertakings, assumptions, forecasts, producers, reports, obligations, predictions, concepts, contracts, Persons, scripts, limitations, conclusions, practices, Areas, drafts, interventions, Resources, Deliveries, deliverables, Prices, sanctions, limits, issues, Reinforcements, directions, differences, concerns, envelopes, clarifications, exceptions, references, situations, programmes, Registries, IMPACTS, deposits, understandings, rations, headings, benchmarks, implications, passages, Possibilities, settings, workers, institutions, Minorities, Suggestions, moves, Stories, crossings, Duties, objectives, appliances, products, contractors, contributions, consignments, phrases, positions, Penalties, aims, responses, citizens, aspects, qualifications, statements, modifications, notes, schemes, issuances, Perceptions, debts, Euros, determinations, verdicts, manuals, Endowments, quotas, expectations, expenses, assignments, convictions, Grants, applications, derogations, tenders, tenets, burdens, overruns, Entries, allotments, systems, Efforts, instances, settlements, Facilities, vibrations, Intentions, pieces, experts, patterns, reasons, foodstuffs, recordings, holdings, attributes, disputes, formulations, estimates, tasks, injunctions, thirds, tribunals, reviews, dictates, components, creditors, targets, postulates, decisions, substances, conflicts, loans, performances, courts, layouts, Adjustments, warrants, Records, runs, departures, Contingencies, fabrics, caveats, objects, questions, members, fines, Parties, editions, Fees, Achievements, canons, mappings, Commodities, needs, registers, Ones, options, Categories, civilians, Maps, certificates, particulars, Ideas, flexibilities, Exigencies, levels, purchases, Languages, payments, Agencies, powers, outcomes, Goals, Capabilities, Motorcycles, stores, women, Tissues, demands, Aptitudes, changes, Groceries, Remedies, Textbooks, VOTES, passageways, views, Motions, transcripts, functions, bonds, solutions, kinds, Attitudes, examples, posts, modes, Crimes, villages, features, Charges, angels, cases, recipients, comments, fixes, sides, sums, passes, sets, towns, claims, Bodies, tools, trails, parameters, sheets, shares, exceedances, games, requests, departments, teachings, types, Axes, Tracks, answers, utilities, data, Classes, paras, Moneys, places, regulators, Prescriptions, offices, appropriations, Bases, goods, initiatives, specifications, matters, instruments, norms, processes, rulings, LINEs, Ships, normas, documents, sentences, entitlements, safeguards, Criteria, Rights, Judgments, referees, rulers, instructions, Activities, contents, disposiciones, provides, conditions, laws, Treaties, directives, credits. Introduced, contained, agreed, Referred, made. prescribed, governed, foreseen, arranged, contained, laid. 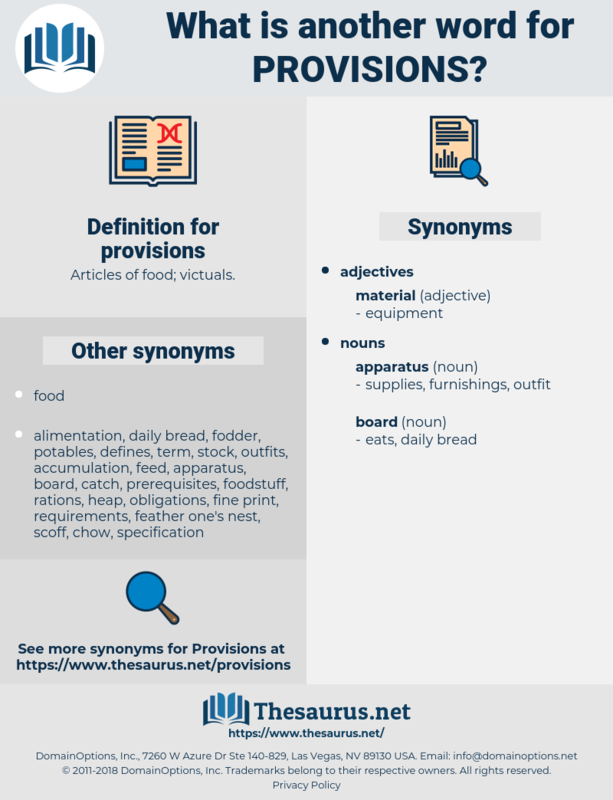 prescribes, imposes, stipulations, empowers, Guarantees, contemplates, S, specifies, mandates, criminalizes, assigns, defines, regulates, requires, supplies, entitles, obliges, devotes, lays, punishes, says, Gives, arises, dictates, sets, reads, Does, makes, processes, provides. The ladies are supposed to bring the provisions, and the gentlemen the wine. There are two provisions in the Constitution, under one of which the case must fall.